Monday 1 September is International Primate Day, a day to highlight the threats and abuses that apes and monkeys face, and also celebrate those we have been able to give a second chance of life. 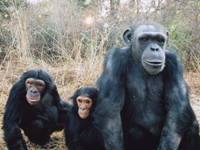 This year we remember fondly Toto the chimpanzee who was the impetus behind this special day. Toto recently passed away but a decade ago, this was the day he returned home to Africa and found companionship for the first time in over 20 years. Stolen from the wild, and from his family as a baby, Toto was trafficked to the United States before being sold on to a circus in Chile. Rescued by ADI, Toto enjoyed 11 years of freedom with his own kind, until he died peacefully in his sleep this summer. Toto inspired our Stop Circus Suffering Latin America, a campaign that has led to animal circus bans in 7 countries and the rescue of dozens of animals – including Peru, where we are at this very moment assisting the authorities in enforcing a ban on wild animals in circuses, just as we did in Bolivia. 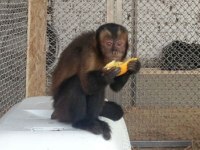 In our ADI Spirit of Freedom rescue centre in Peru we already have three capuchin monkeys saved from the pet trade, and nine lions from three circuses - by the end of the operation we could be relocating as many as 35 lions to roam free in sanctuaries. As well as Toto, ADI has rescued baboons, macaques and capuchins from suffering, some have been released back into the wild, others, enjoy the very best of care in sanctuaries. This epic rescue – probably the biggest enforcement and rescue operation of its kind ever undertaken – is being funded entirely by ADI supporters. Play a role in our historic Operation Spirit of Freedom mission and help us remove the animals from the circuses and care for them. The monkeys will be relocated in sanctuaries in Peru.